Institute of Banking and Personnel Selection (IBPS) is all set to conduct Common Written Examination for recruitment of Probationary Officers. Institute of Banking and Personnel Selection (IBPS) is all set to conduct Common Written Examination for recruitment of Probationary Officers. 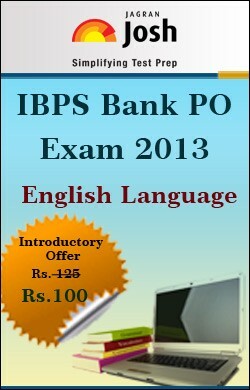 IBPS PO Exam 2013 will be held on 19 October 2013, 20 October 2013, 26 October 2013, and 27 October 2013. The common written examination includes 5 sections comprising General Awareness, English Language, Reasoning, Quantitative Aptitude, and Computer Knowledge. Reasoning Section of IBPS PO Exam comprise 40 questions from different topics. Jagranjosh.com has come with IBPS PO Exam 2013: English: Study Material (E Book), which is an ideal platform for candidates, who are preparing English Language Section. The book is prepared by banking experts of jagranjosh.com after blending all ingredients of Basics of English along with model questions and practice sets. The English Language Section of IBPS PO Exam Question Paper contains relating to Spotting the Error. In these questions, the sentence is divided into 4 parts, marked 1, 2, 3, and 4. 5 refer to ‘No Error’. The candidates have to find out the errors related to article, preposition, tense, verb, noun, pronoun, adverb, adjectives, conjunction, subject verb agreement etc. Sometimes, the errors may also irrelevant words and superfluous use of some words. The candidates should have good knowledge of rules of Grammar and its correct usage in right perspective, which is only way to attempting these questions. More and more practice is required to gain confidence in grammar. Practice of previous year question paper and Practice Paper is perfect way to score well in spotting the Error Questions. Question on ‘spotting the Errors’ can be answered on the basis of candidate’s knowledge of grammar especially parts of speech. The important rules of parts of speech can be mentioned categorically in the following manner. 1. Certain nouns always take a singular verb. Scenery, advice, information, machinery, stationery, furniture, abuse, fuel, gram, issue, bedding, repair, news, poetry, business, economics, physics, mathematics, classics, ethics, innings. 2. Some nouns are used as plural nouns and always take a plural verb. 3. Some nouns are used in a plural form and take a plural verb. Trousers, scissors, spectacles, shorts, measles, goods, premises, thanks, tidings, annals, chattels, etc. (a) Where are my spectacles? (b) Trousers are also available at cheaper prices. 4. Certain nouns that indicate length, measure, money, weight or number, if they are preceded by a numeral, they remain unchanged in form. Foot, metre, pair, score, dozen, year, hundred, thousand, million. (a) It is a two-year post-graduation diploma course. (b) I have bought twelve dozen of apples. 5. Collective nouns like jury, public, team, committee, government, orchestra, company, etc. are used both as singular and plural depending on the meaning. When these words indicate a unit, the verb is singular, otherwise the verb will be plural. (a) The public were furious over the issue. (b) The orchestra has not started yet. The above concept is taken from IBPS PO Exam 2013: English: Study Material (E Book).